I’m developing quite a weakness for palettes at the moment. They’re just so pretty to look at! I decided recently that I needed a new eye palette, with a bit more varied colours for when the browns of my Naked Palette just won’t do. During a wander around Boots I happened upon the Seventeen stand. For a budget brand, Seventeen is pretty good. Their Doll Eye mascara is one of my all time favourites, and their long lasting lipsticks really do last forever. 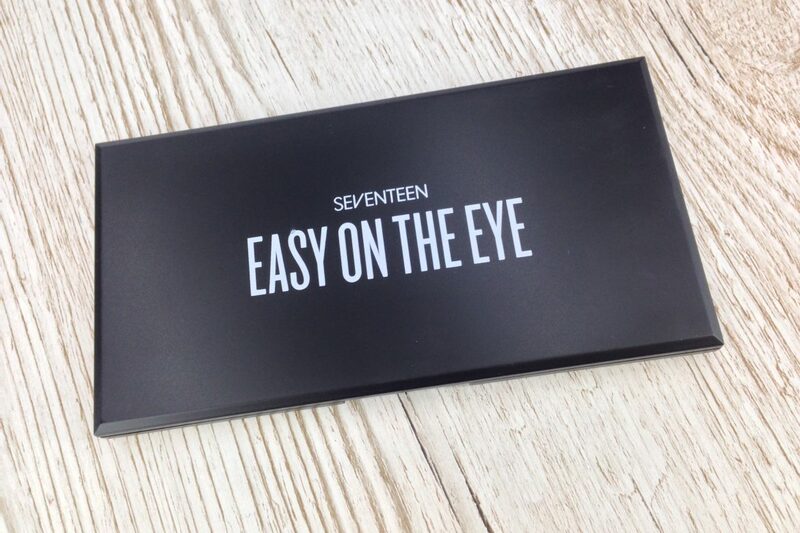 I had been tempted by a Sleek palette but I noticed that the Seventeen ones were on offer – just £4.99 for 12 shades! As I knew I was a fan of Seventeen and had never tried Sleek before, I went with what I knew (boring, I know!) My first complaint with this is the packaging doesn’t really help show the colours in the palette too well – the photo on the back of the box was hugely photoshopped (and small) and there were no testers on the stand. For a £5 palette this is incredibly well made and the pans felt sturdy in the unit. There’s also a mirror in the lid which while I won’t use it, found to be a nice touch. Inside the palette you’ll find 8 powder shades. 3 metallic and an eye primer. I wasn’t too bothered by the primer as I have my UD one and so I haven’t tried it. As there were so many colours, I decided to give them a swatch. A lot of these shades are a bit darker than I was expecting. Some of them seemed quite light in the packaging but once on my skin feel a little too dark for day to day wear. As you can tell from the swatches, this doesn’t apply too smoothly either. It can be tricky to get this applied quickly and nicely as it needs a little work to get a nice smooth finish. It’s also quite loose so I had to be careful to blow the applicator before taking it anywhere near my face. Sadly, even with my UD primer potion these creased really badly throughout the day until I was just left with a big line in the middle of my lid. This is a terribly lit picture but I wanted a close up of the metallics. I’ve only used the peachy one on the right on my lids so far and I really didn’t like it. You can’t tell from the swatch but when applied across the whole lid it just ended up looking a bit… blotchy? It also creased terribly, and quicker than the powders. I’d be open to trying the others, but more as an eyeliner than anything else. I used the brush the palette came with and liked the black end to apply the powder to my lids but the other end was useless. On first use it shed three bristles on my eyelids that were a massive pain to get rid of. This is a shame as I’ve got some Seventeen make up brushes and absolutely love them. Overall I’m really disappointed with this palette. It’s even more disappointing as it’s a brand I usually love. That’ll teach me for being boring and sticking with what I know. Maybe I should’ve bought the Sleek one afterall?